Conjunctiva (named because it conjoins the eyeball to the lids) is a thin, transparent mucous membrane that lines the posterior surface of the lids, and is then reflected forwards on the eye. Conjunctiva is continuous anteriorly with the epithelium of the cornea. Recessed in the eyelids, the conjunctiva forms a cul de sac, which is open in front at the palpebral fissure, and only closed when the eyes are shut. Although all parts of the conjunctiva are continuous each has been given its own name to emphasize anatomic differences. The palpebral portion lines the eyelids; that portion joining the eyeball is the bulbar conjunctiva and that forming the conjunctival sac and reflecting on the eye is called the fornix. The palpebral conjunctiva is subdivided into marginal, tarsal, and orbital zones. The marginal zone transitions between skin and conjunctiva and shows minimal keratinization. The tarsal conjunctiva is a fairly flat layer. The orbital zone shows more numerous Goblet cells. 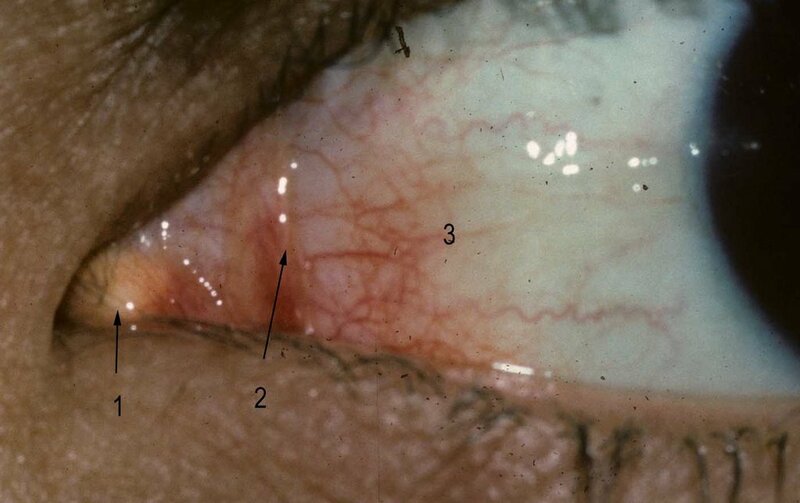 The regional variation of the conjunctiva start with an overview in a photograph in which the patient is looking up. The limbus (1) is the junction of the conjunctiva and cornea. The bulbar conjunctiva (2) covers the eyeball and extends into the recess created by forniceal conjunctiva (3). The tarsal conjunctiva (4) covers the tarsus. 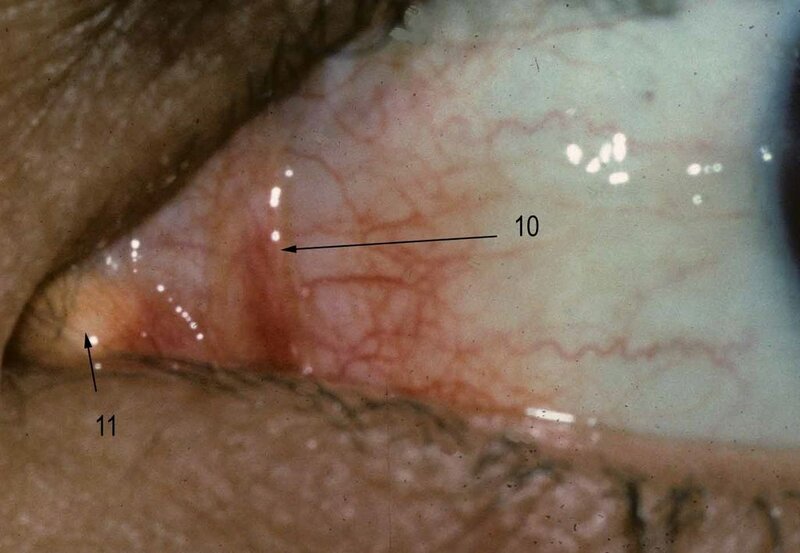 The marginal conjunctiva (6) is at the eyelid margin where the epithelium will begin to be keratinized. The punctum (5) is also shown. A sagittal or vertical section of both eyelids and the eye are shown to the left. The cornea (1) and lens (2) provide orientation. The fornix (3) has more redundant conjunctiva. The marginal conjunctiva(4) and tarsal conjunctiva (6) are indicated. The palpebral portion of the lacrimal gland (5) is also shown in this photograph. The composition of each of these regions varies in the Goblet cell density within the epithelium. In addition, note the greater length of the tarsus and higher number of Meibomian glands in the upper eyelid compared to the lower eyelid. 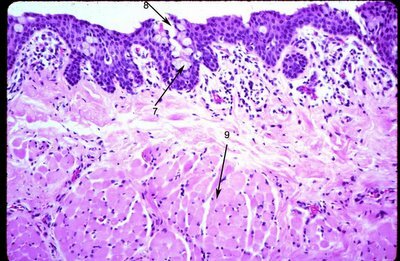 This has implications for the origin of sebaceous carcinoma. This photograph also give a view of the cross section of the eyelid and the alert student will notice the skin externally and orbicularis muscle. 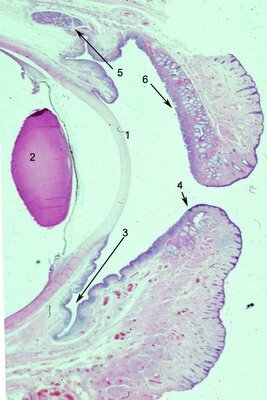 The histology of the conjunctiva varies according to its topographic location. The bulbar conjunctiva is relatively less undulating and contains fewer Goblet cells. 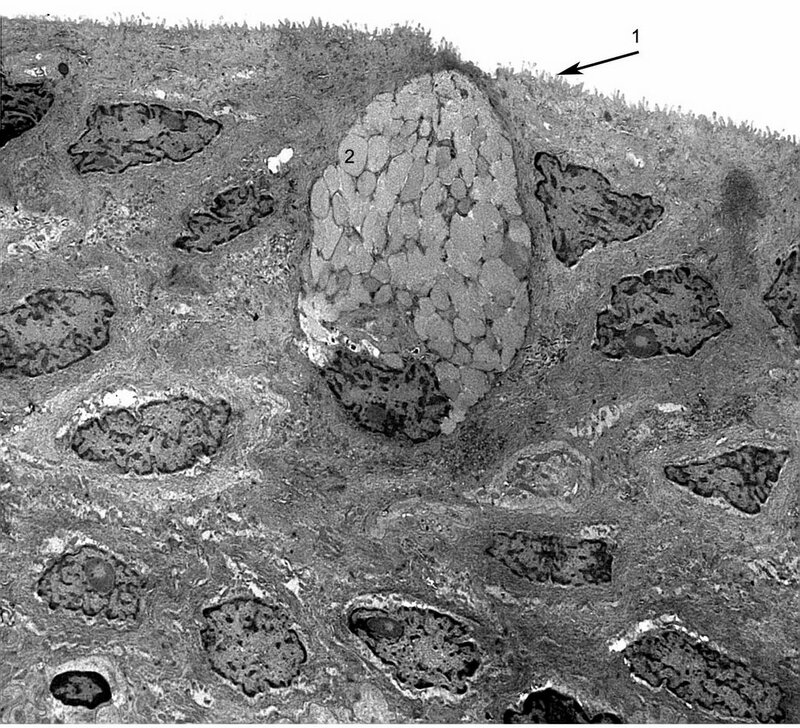 In this electronmicrograph the microvilli cover the superficial layer of the epithelium (arrow 1) and the mucin granules (2) of the Goblet cell are captured in a plane lacking contiguity with the surface. The Goblet cells produce gel forming mucins called MUC5AC that may be critical to providing lubrication to the ocular surface. The tarsal conjunctiva shows a stratified squamous epithelium (1) that has few Goblet cells (none seen here) overlying a very dense fibrous stroma, tarsus (2). Meibomian glands are embedded in the tarsus. 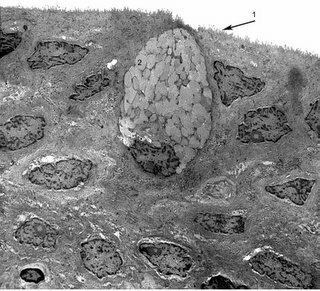 This photomicrograph from the fornix shows numerous goblet cells (7) in infoldings of conjunctiva that form the pseudoglands of Henle (8). Striated muscle (9) is seen beneath the substantia propria. The puncta open on to the marginal portion of the conjunctiva, and through them the conjunctival sac becomes directly continuous with the inferior meatus of the nose via the lacrimal passages. 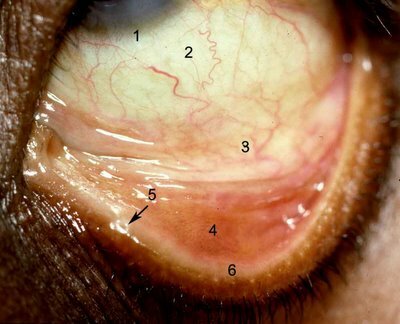 The conjunctiva contains specialized folds or bumps called the plica semilunaris (arrow 10 in the clinical figure) and caruncle (arrow 11). The plica semilunaris lining contains Goblet cells while the caruncle may have hair, sebaceous glands emanating from the surface. The histologic appearance of the caruncle is shown. 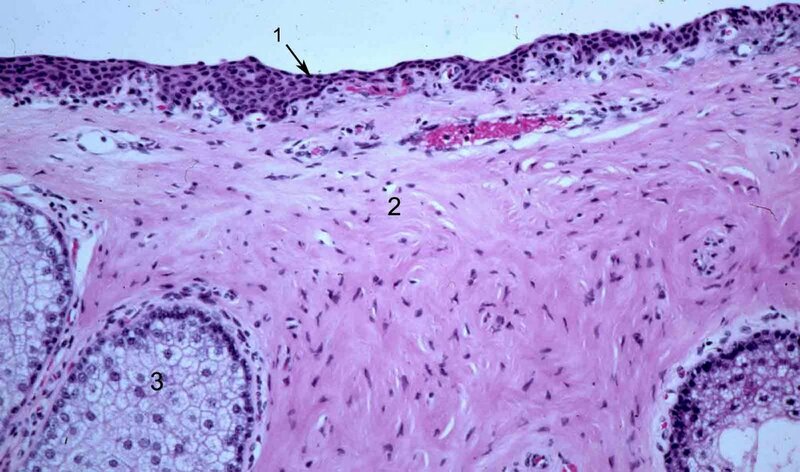 Transitioning to a stratified squamous epithelium with few goblet cells (area encompassed by arrows at 11), the caruncle may show focal surface keratinization (arrow 14). 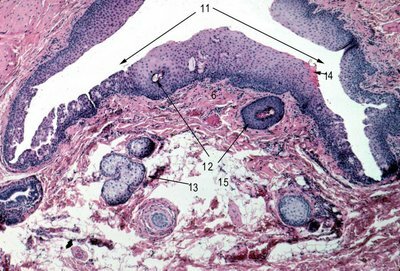 The caruncle contains hair follicles (arrow 12), sebaceous glands (arrow 13) and adipose tissue (arrow 15).